An improved understanding of the effects of defoliation on forage yield and quality would improve the ability of agronomists, farmers, and crop insurance adjusters to assess the economic impact of hail damage to corn harvested for forage. The objective of this study was to evaluate the yield and quality effects of defoliation on corn grown for forage production. Defoliation experiments were conducted during 2000, 2001, and 2002 at Arlington and Marshfield, WI, and State College, PA.
Forage yield decreased as leaf removal increased in severity, and as time of defoliation neared silking. As defoliation increased forage yield decreased at a greater rate (Figure 1). 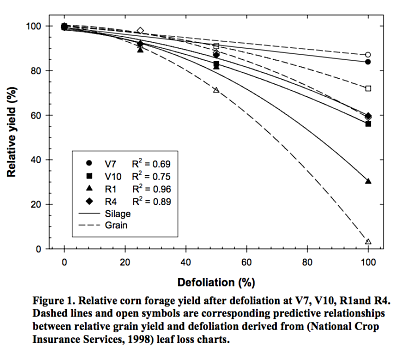 Averaged across all environments, forage yield decreased 16% when complete defoliation occurred at V7. Likewise 100% defoliation decreased forage yield 43%, 70%, and 40% at V10, R1 and R4 growth stages, respectively. Greater forage yield decreases are measured with early defoliation (V7 to V10) than predicted grain yield decreases currently used by hail adjusters. This likely occurs because both increased leaf removal and decreased grain yield combine to reduce forage yield. The response to defoliation from simulated hail damage is different between corn forage and corn grain. 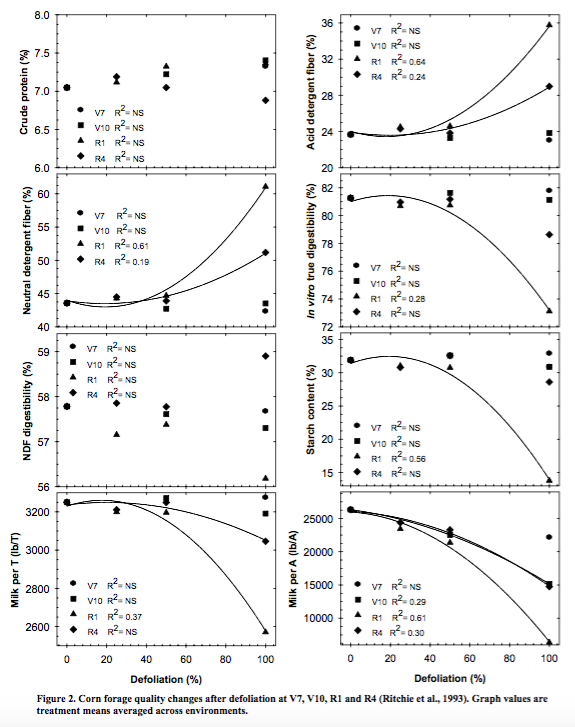 Most quality responses resembled yield responses for each defoliation treatment across environments (Figure 2). Increasing defoliation either did not affect quality, especially at V7 and V10 stages, or lowered quality, especially at the R1 and R4 stages of development. The largest differences in NDF, ADF, and in vitro true digestibility occurred at R1 and R4 at the complete defoliation level. NDF increased from 44% in the control to 61% with complete defoliation at R1 or 51% at R4. In vitro true digestibility decreased from 81% in the control to 73% or 79% with complete defoliation at R1 or R4, respectively. Starch content was most affected with defoliation at R1. Across environments NDF digestibility was not significantly affected. These forage quality changes resulted in decreased Milk per Ton and Milk per Acre in most environments. University of Wisconsin-Extension United States Department of Agriculture Wisconsin Counties Cooperating and Providing Equal Opportunities in Employment and Programming.